McLaren's film, for all their playfulness and visual invention, only look easy. They are the product of an exacting methodology. A good example is McLaren's most famous film, Neighbours (1952) (see embed at top of this post). The film's concept seems simple: two men, the titular neighbors, sit on their respective sides of a fence and read newspapers. This image of peace disintegrates into a protracted melée. However, the two actors are filmed as still objects -- McLaren captures their movement as a slow-motion animation. When Neighbours unspools at a frame rate of 24fps, the action depicted on the screen and the action while filming (i.e. that occurring during the process of filming) are elided. This is another confirmation of the idea that, for all of Neighbour's herky-jerkiness, the film's grand conceit is to portray stillness as motion. McLaren's most interesting innovation, in my opinion, is his use of a motion picture projector as a musical instrument. Like his temporal disruptions in Neighbours, McLaren's manipulation of 32- and 16mm film optical and soundtracks are the product of a careful calculation. 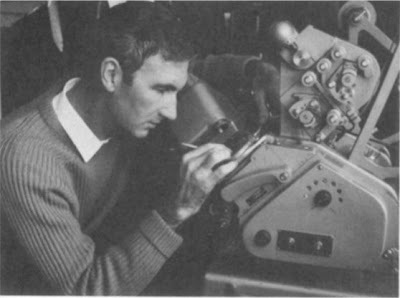 In Pen Point Percussion (1951), directors Don Peters and Lorne Batchelor show McLaren at work, using film as a type of music recording device. Using various brushes and black ink, McLaren paints a series of lines and blotches on the film soundtrack. When the film is run through a projector, the trackheads register the lines and blotches as noise. With prescribed film rate, as well as with a measured use of different types of brushstrokes and lines, not only is McLaren able to calculate the pitch and speed of the various tones, but he can also "choreograph" them so that they correspond to the images on the film's optical track. This results of this work is visible in Neighbours as well as in Rhythmetic (1956), a film in which a simple mathematical equation seems to dance before our eyes. Between the realm of "pure forms" and "symbols" is a small sun-like drawing. Labled as a "different kind of association entirely-images", the diagram shows light propagating from a singular source, most likely a camera projector. This diagram thus suggests how the camera projector is the primary mediator of this new "different kind" of experience. For his lecture, the director also showed a small diagram (above) that, much like Pen Point Percussion, illustrates his soundtracking methodology and confirms his cinematic worldview. Here, a series of lines show how scratches on leader tape can be drawn in order to generate sound. But in this context, they are presented instructionally, as if McLaren was reducing his method to a series of inscriptions and heuristics. The diagram suggests a notational method that compliments (and in some cases, anticipates) the later work of composers like Krzysztof Penderecki, Karlheinz Stockhausen, John Cage, and Anthony Braxton. The sheer output and educational themes of much of his work also anticipates the films of Charles and Ray Eames. The main difference is that McLaren never considered himself anything but a filmmaker. The creation of sounds was just a necessary part of image-making.